If you are looking for the least expensive way to get your Utah Concealed Carry Permit (CFP) in your pocket, then our CFP course is not for you. This thorough Firearm Familiarity class provides everything you will need to apply for your permit. Do you really want to carry a gun with the minimum amount of knowledge you can get by with? I think not. At SDS we cover material that would be helpful if you ever have to use your firearm to protect yourself and have to subsequintly interact with the police. We explain the effects of mindset on the outcome of a confrontation both from your perspective and the criminal's. Our Tactical Defense firearms courses are designed to teach the everyday citizen how to safely handle and fight with their gun. If you don't know what you don't know, you cannot expect to prevail in the fight of your life. Self-Defense Solutions will empower you with new skills and mindsets that build on each previous class. 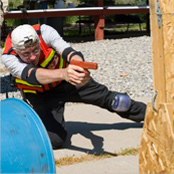 These skill sets include learning how to run your gun, run WITH your gun and defensive responses using your gun. That’s right, a real free class! This class is for Women only (no husbands, boyfriends, significant others or sons – NO MEN period. Not even to watch) Here is a chance for any woman to come and learn firearm safety and also learn to shoot at no charge for the instruction. This is my salute to women that originally started out as a Mothers Day Special.